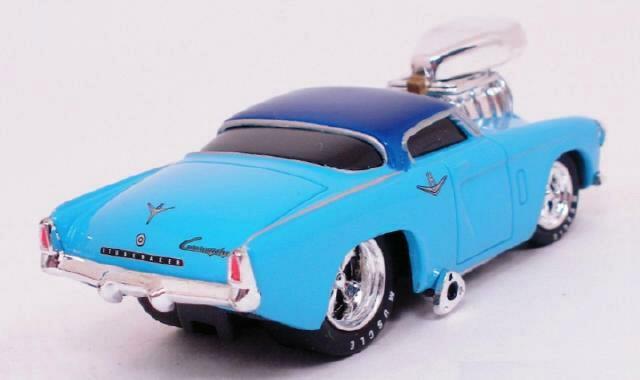 This sharp 1953 Studebaker Starlight Coupe Street Rod was built by Trevor Halstead of Hamilton, New Zeland. 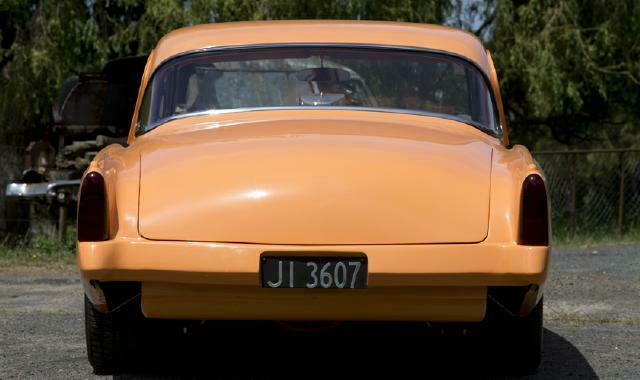 Information provided by Diane Halstead indicates that it is the only 1953 Stalight Coupe in New Zealand. It was imported from the states in the early 1960’s and spent a lot of time backing a boat into the sea until the mid-1980’s. 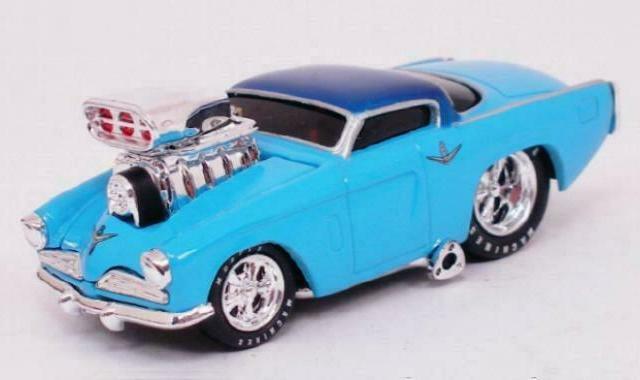 The body required extensive rebuilding during the process of its conversion into a street rod. In addition, the chassis was extensively modified and strenghtened using the center section from a 1961 Hawk and custom fabrication. The finished product exhibits outstanding craftsmanship as can be seen in the pictures above. Trev's Starlight is powered by a stroked Big Block Chevy 454 with and Isky cam and twin Holley 600 CFM carburetors. The engine is fitted with custom headers and 3" lake pipes mounted outside the sills. The copper radiator has custom built brass tanks with a three row core and custom stalnless steel cover and electric cooliong fan. A GM Turbo 400 automatic transmission with a 2000 RPM converter and cooler connects to a narrowed 9" Ford rear with built-in lowering blocks and flat leaf springs. Front suspension is Holden LX Torana which I understand is popular in that part of the world. The front sway bar was custom made and the rear sway bar is from an Australian Ford EB Falcon. Dupont custom mix 2K system orange paint was used on the chassis and running gear as well as the interior parts, dash, inner guards and firewall. The outer body is a 2K base preparation with acrylic lacquer finish. Iterior panels were made from Palight acrylic sheet covered with burnt orange velour. Front bucket seats are Mitsubishi and rear seats are modified originals. 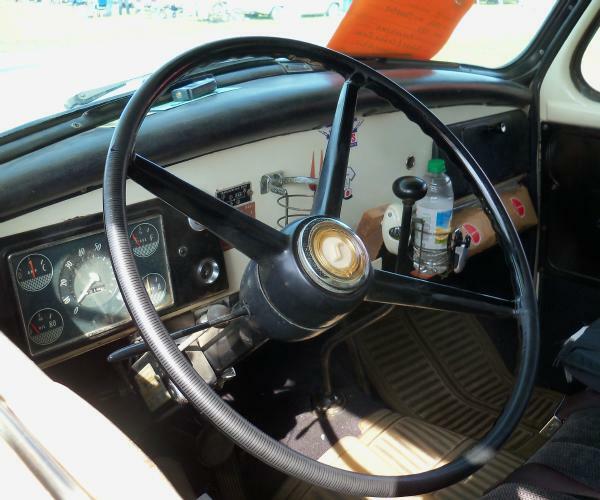 The right hand drive dash was custom built from the original left hand drive dash and a 1955 Champion dash. 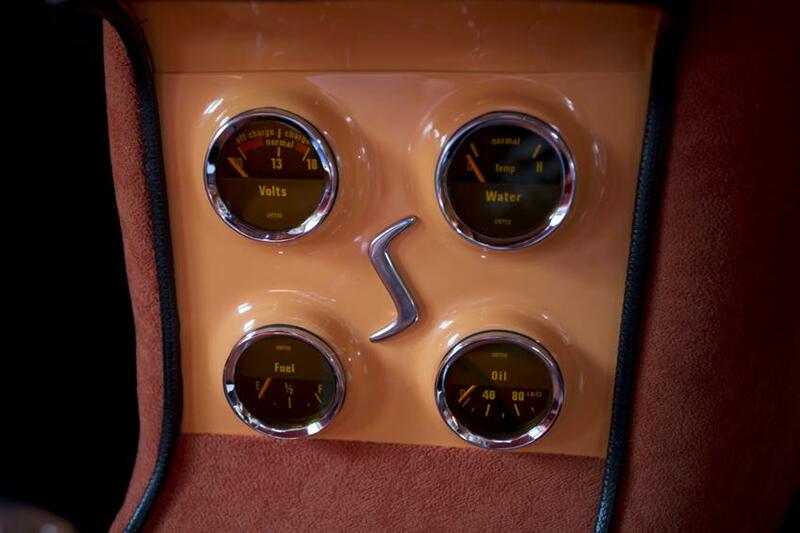 Instrument pods were formed from exhaust tube and the gauges are a mix of Smiths-Jaguar and VDO with chrome bezels and orange tinted glass and pointers. 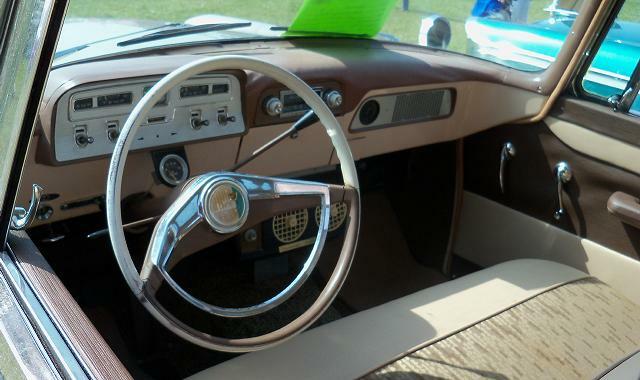 The center console was custom built and the Holden steering wheel is fitted with a 1956 Studebaker horn button. 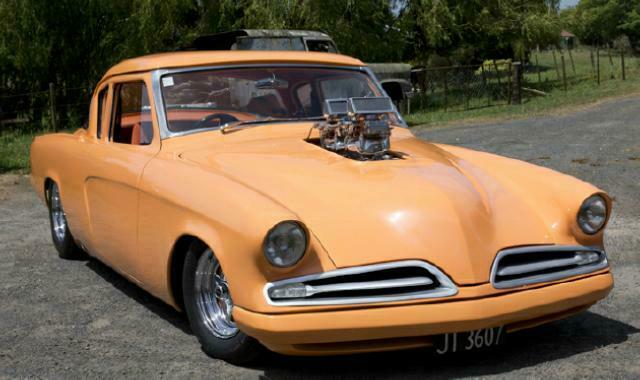 Trev has built several Studebaker rods including two which appeared on this page in August 2008 in a piece on New Zealand Studebakers. 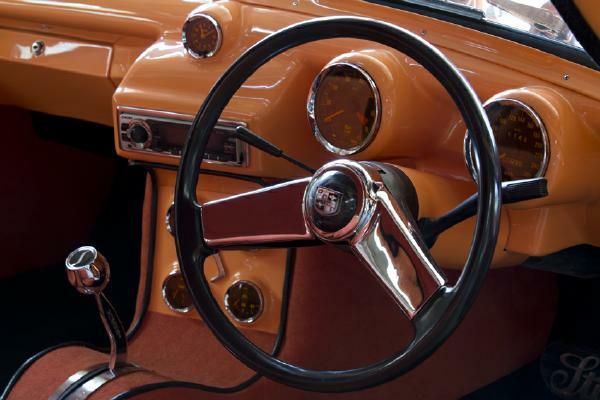 He operates Custom & Classic Restorations which is a full-time business specializing in custom car building. His Starlight has been featured in NZV8 Magazine and discussed in the SDC Forum. Thanks to Rtrev Halstead for sending the pictures to Bill Junge, to Bill Junge for forwarding the pictures to me, and to Diane Halstead for providing detailed information about Trev's car. If you own or once owned a Studebaker or related vehicle and would like to see your car as "Stude of the Month" or in the "Cool Studes" section, or if you have other pictures or material that you would like to contribute to this page, please e-mail me here. I can accept either electronic or hard copy images. The Main Page is issued every other month so the next edition will be December 2014. 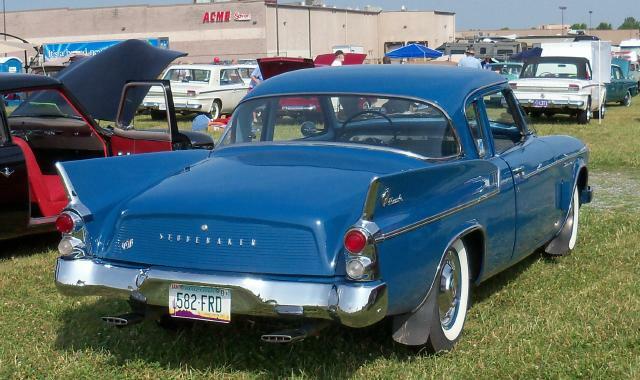 This sharp 1958 Commander Starlight Hardtop is owned by Robert Wilson of New Castle, Delaware. 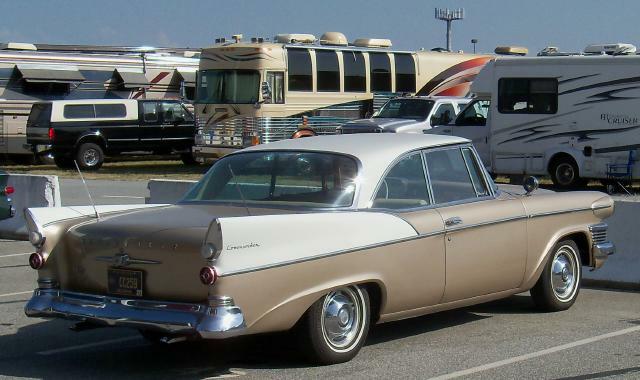 The Starlight Hardtop was a new body style for 1958 and it turned out to be a one year only model since this was the last year for the standard full-size Studebaker line. Starlights were available as Commanders and Presidents and only 3,726 were built of which 2,555 were Commanders. Most Starlights were two-toned but I did have a friend in high school whose father had an all white 1958 President Starlight. 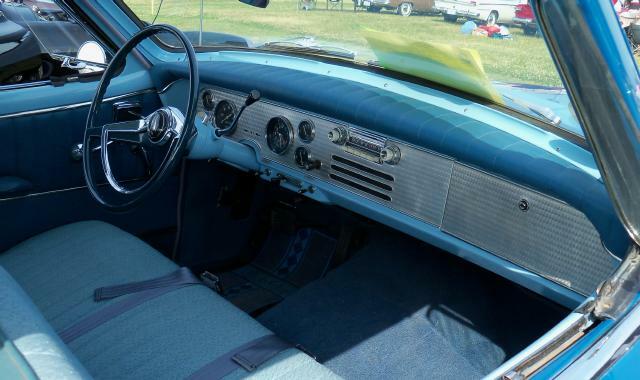 Robert's Starlight is equipped with air conditioning, factory push-button radio, overdrive, and dual exhausts. 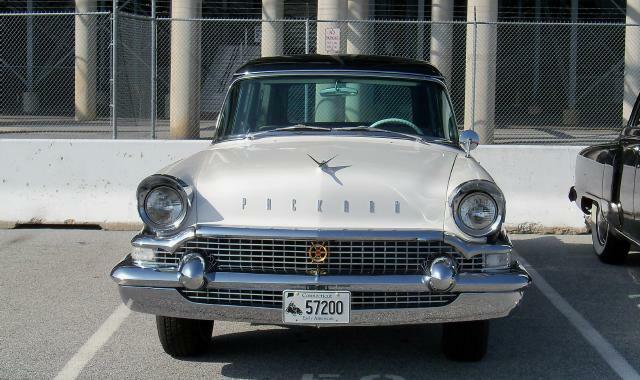 Studebaker's 259 cubic inch V8 was standard on 1958 Commanders. 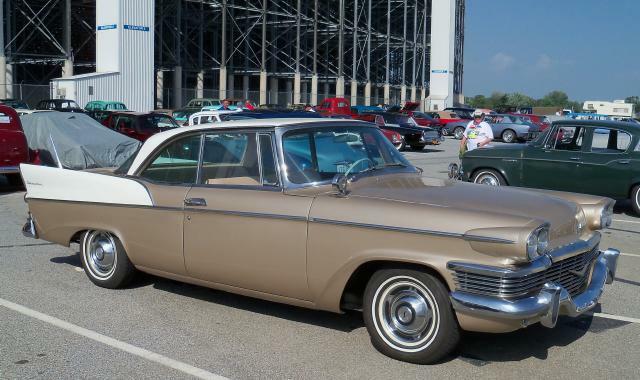 Robert's Starlight took a first in Division 2, Early Postwar Sedans and Wagons, with 378 points. 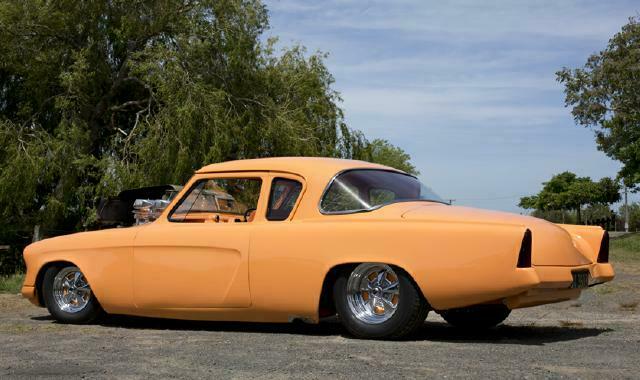 This beautiful 1960 Studebaker Hawk Coupe belongs to Malcom J. Stinson, Jr. of Showlow, Arizona. 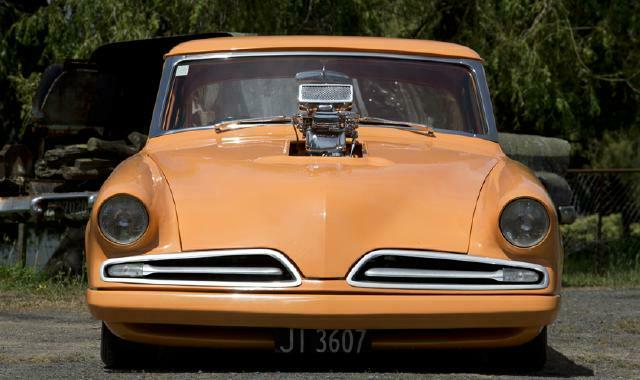 After a one year lapse during which the Studebaker 259 cubic inch V8 was the largest engine available, 1960 Hawks were equipped with the Studebaker 289 V8 as standard. Six cylinder Hawks were dropped from the domestic line but continued to be available in export markets. Production of 1960 Hawks was 4,507 units which was a drop from 7,788 in 1959. Malcom's Hawk is equipped with Flightomatic automatic transmission, Twin Traction limited slip differential, and a factory push-button radio. 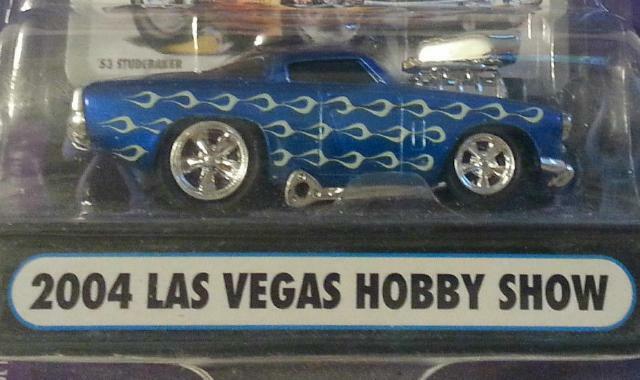 The color is Gulfstream blue which was the darker of the two blues available that year. Malcom's Hawk took a first in Division 4, Coupes (C Body) and Hardtops (K Body), with 384 points. 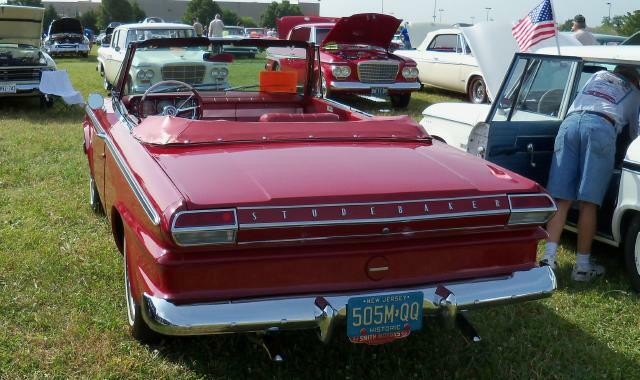 This rare 1964 Studebaker Daytona Convertible in Bordeaux Red belongs to Ed and Laura Jones of Beachwood, New Jersey. According to its information card, it was shipped from the factory on the last day of automobile production in South Bend. 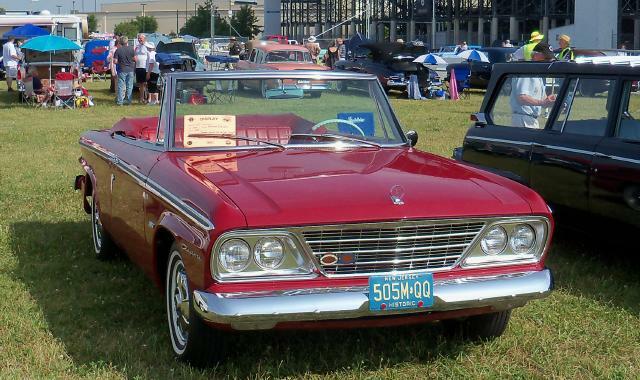 It is one of only 703 convertibles produced for the 1964 model year of which 286 were assembled in Canada. 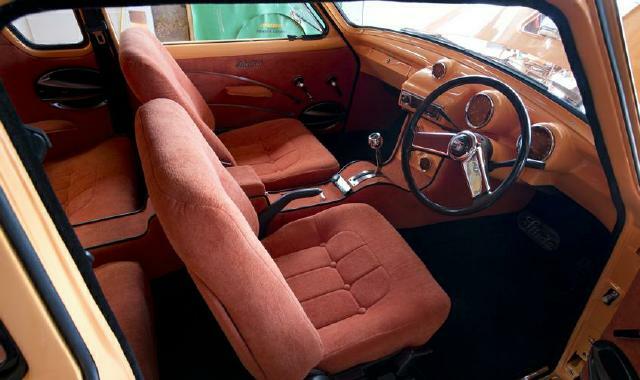 This example is powered by a Studebaker 289 cubic inch V8 with automatic transmission and is somewhat unusual in that it equipped with bucket seats and tinted glass but no factory radio. 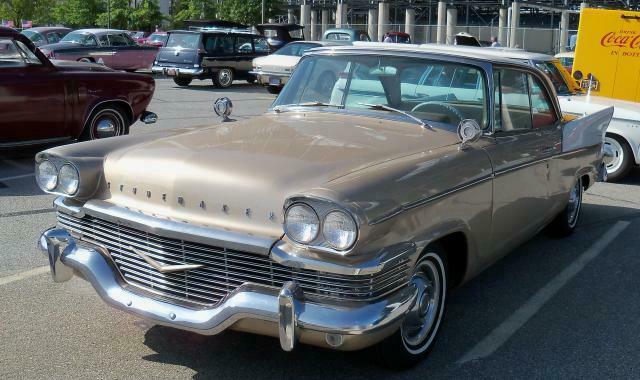 Production of Studebaker convertibles ended with the 1964 model. Ed and Laura are Studebaker parts vendors and I have purchased parts for my 1964 Wagonaire from them. This car was registered as concours display so it was not judged. 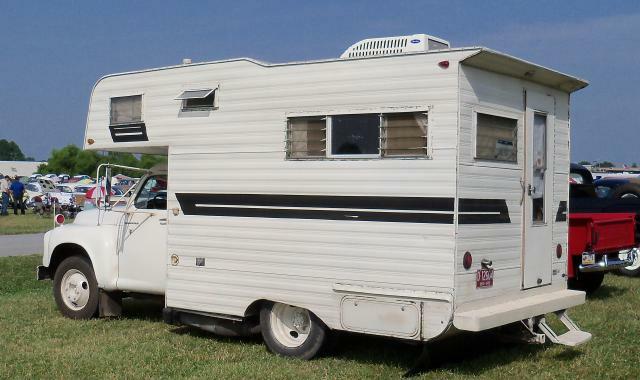 This neat 1962 Studebaker Transtar Motor Home style camper is owned by Robert and Debbie Dean of Albany, Ohio. It is built on a one-ton Transtar chassis and is powered by a Studebaker 289 cubic inch V8. Here is picture of the dash area. Apparently this vehicle gets around because according to its information card it has been to twenty-two SDC International Meets. 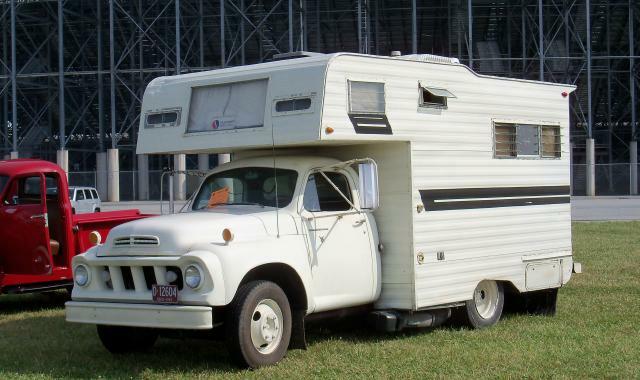 Studebaker campers are rare but not unheard of as a Google image search for "Studebaker camper" brought back several others including a few similiar to this one as well as examples with M Series and Champ cabs. The Deans also own a 1964 Studebaker Daytona Convertible. This vehicle was registered as concours display so it was not judged. 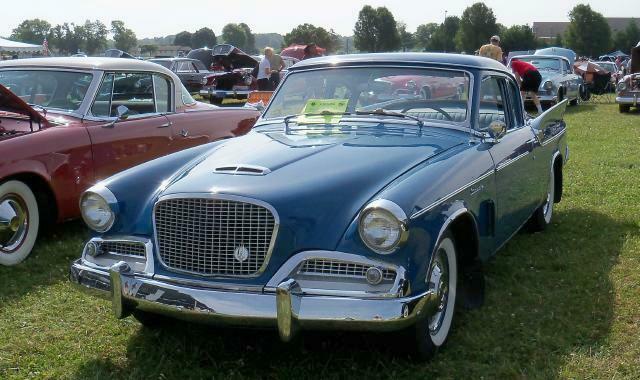 The pictures were taken at the Studebaker Drivers Club International Meet in Dover, Delaware in July of this year. This outstanding 1957 Packard Clipper Station Wagon is owned by Chip Dayton of Cheshire, Connecticut. 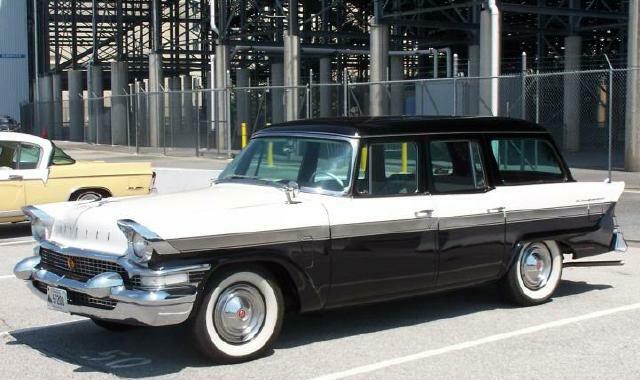 It is one of only 869 Clipper wagons produced for the 1957 model year. 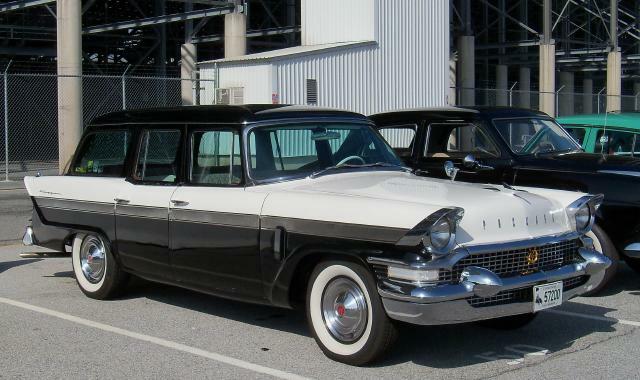 Basically it is a Studebaker President Broadmoor Station Wagon with revised front and rear ends, a revised dash, and more luxurious trim. 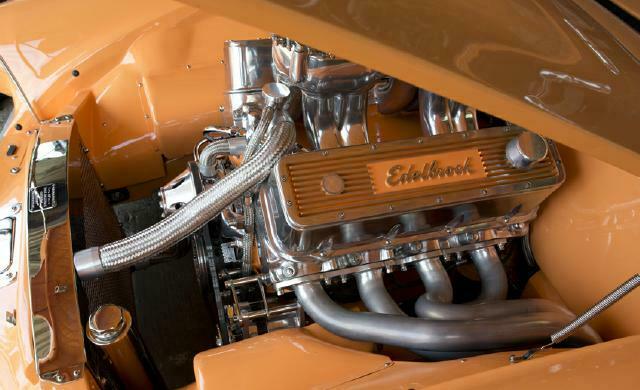 Studebaker's 289 cubic inch V8 with supercharger rated at 275 horsepower as in the Golden Hawk was the standard engine for all 1957 Packard Clippers. 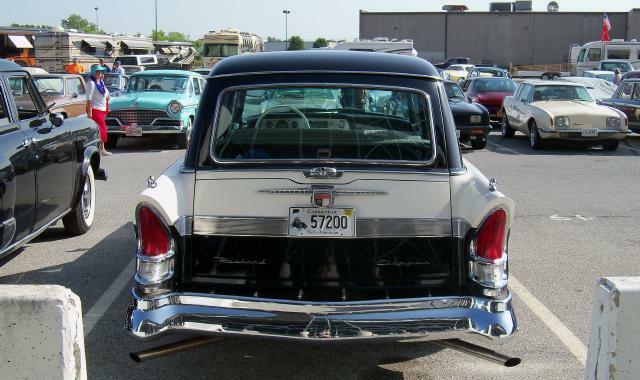 The 1957 Clipper wagon was marketed as the "Country Sedan" while its companion 4-door sedan was marketed as the "Town Sedan" with fewer than 5,000 total being sold. These pictures were also taken at the 2014 International Meet in Dover, Delaware. Chip's wagon took a first in Division 2 with 388 points. 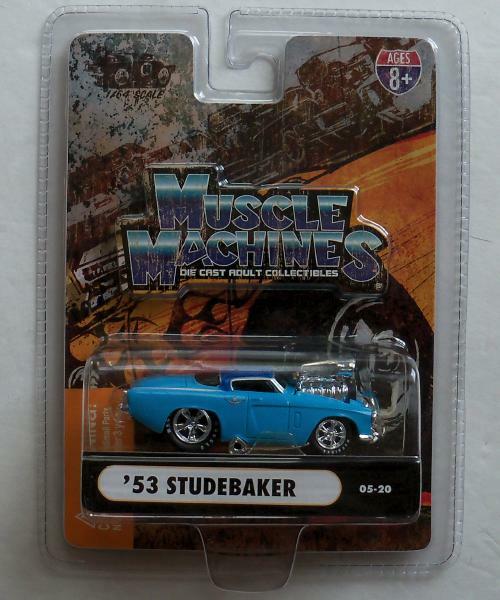 The Muscle Machines 1:64 scale 1953 Studebaker Starliner Hardtop Street Rod has been issued in several variations of which the blue over blue version is one of the most attractive. This version comes packed in a hard blister pack which can stand on its own for display. Other variations were packed roof facing out such as this silver with red flames example. 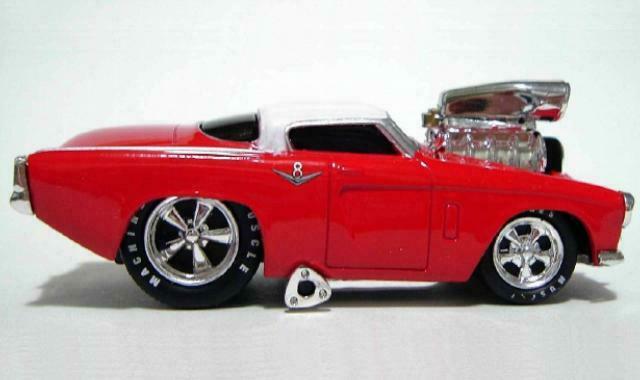 Here is a side view of this model in red with a white roof which is also quite attractive. This model seemed to be a good choice for Stude Toy of the Month given its similiarity to the October Stude of the Month. 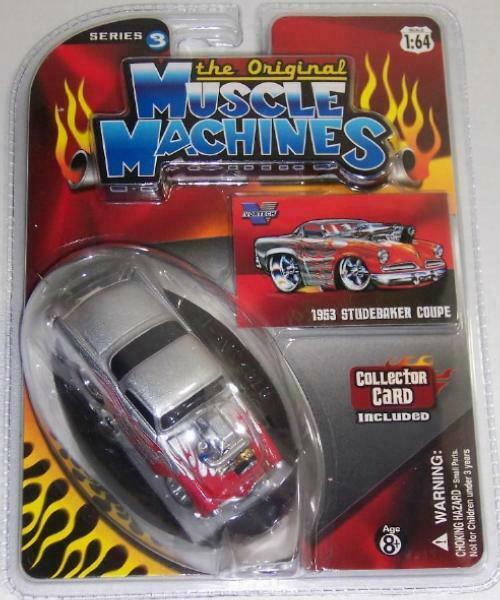 Examples of the Muscle Machines 1953 Studebaker Hardtop can be found on eBay with prices ranging from around $6 for common versions to around $20 for rare variations such as the special 2004 Las Vegas Hobby Show issue that was limited to 1,296 pieces.